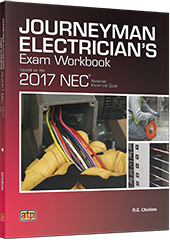 Journeyman Electrician’s Exam Workbook Based on the 2017 NEC® is designed to help applicants prepare for the journeyman electrician’s state or local electrical licensing examinations. This practical workbook offers an exam overview, the requirements involved, and preparation strategies for applicants. The workbook contains over 800 review and sample licensing exam questions and problems based on NEC®-related definitions, calculations, and factors associated with specific residential, commercial, or industrial applications. Review question answers are provided in the workbook, accompanied by NEC® references and solutions as applicable.